There is no question that Governor Mitch Daniels is popular. But I am reminded of the time when another popular Republican Governor, Bob Orr, reached the end of his eight years of service. In 1988, John Mutz, then Lt. Governor, was running to replace Orr, basically promising four more years of Orr-type leadership. Mutz was facing Secretary of State Evan Bayh in the general election. I'll never forget a poll a few months before the election asked if the State was going in the "right direction." About 70% said yes. The next question asked if Hoosiers should change direction. About 70% said yes. That spelled trouble for Mutz. The fact is that Hoosiers occasionally like to change things. Running as a Governor Daniels, Part II, would be a tremendous political mistake for Congressman Mike Pence. Pence is up against a seasoned, skillful politician, former Indiana House Speaker John Gregg. While overall Daniels is popular, there are aspects of the Governor's record that are easily exploitable. Expect Gregg to try to hang around Pence's neck the Medicaid privatization fiasco, various agency scandals, the accounting errors that resulted in millions of dollars being lost in the state's couch cushions, and the Governor's recent comment suggesting that state agencies paying nearly $3 million in late fees over the past 2 years is just not a big deal. 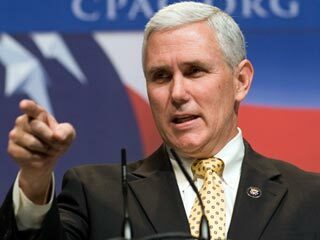 In his quest to be Governor, Pence would be well advised to be his own person. He needs to say that, while he admires Daniels, he has substantial differences with the Governor on how state government should be run. He needs to say that he would take an active role in reigning in mismanagement within the agencies and that he finds it unacceptable for the state to misplace millions or for state agencies to spend $3 million on late fees because bills aren't being paid on time. He needs to say that the Governor is wrong that things couldn't be run better. If Pence's political advisers want a model in what can go wrong for a Republican running to replace a popular outgoing Republican Governor, they might take a look at the Mutz-Bayh race of 1988. I don't follow the comparison at all, Paul. Mutz was a part of Orr's administration. Pence couldn't be further from Daniels. He has played absolutely no part in any decision Mitch Daniels has played the past 8 years. The voters will not make the distinction. Also Pence is not doing anything to distance himself from Daniels! Believe me Gregg will pound on the misteps of Daniels and hang them around Pence's neck! It is extremely disconcerting to many republicans that Daniels dismisses the states recent accounting snafus as not being a big deal! Also Pence may get slammed over his vote for the super committee. One thing though it seems weird now that Lugar has lost the primary the mainstream media in Indiana are going after Mitch more than they have in the past. They have known since 2005 about his problems with paying the states bills ontime, FSSA,INDOT and DWD etc,. And if they had reported more on them then alot of problems could have been prevented. Instead they largely sat on their hands and did nothing! Gary, I totally agree that Pence, is in a much better position to distance himself from the incumbent Republican Governor than Mutz did. I don't know that Pence will though. I can see Pence's political advisers making the mistake that they should latch closely onto the coattails of Daniels and not let go. I'm hoping they don't give him that advice, but I think it likely they will. Sorry, Gary. Pence is Daniels, but with a heavier measure of religious zealotry. Indiana government is notoriously for sale, and Pence wants to change nothing more than taking over for Daniels as the new cashier. We should remember that Pence was once a Democrat.